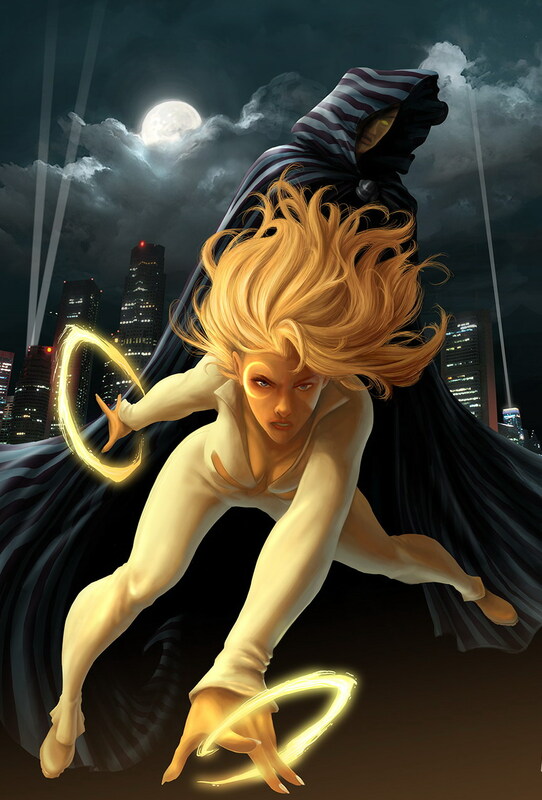 Cloak and Dagger (Tyrone "Ty" Johnson and Tandy Bowen, respectively) are a fictional (Character) comic book superhero duo in the Marvel Comics Universe. They were created by writer William "Bill" Mantlo and designed by artist Edward Hannigan. 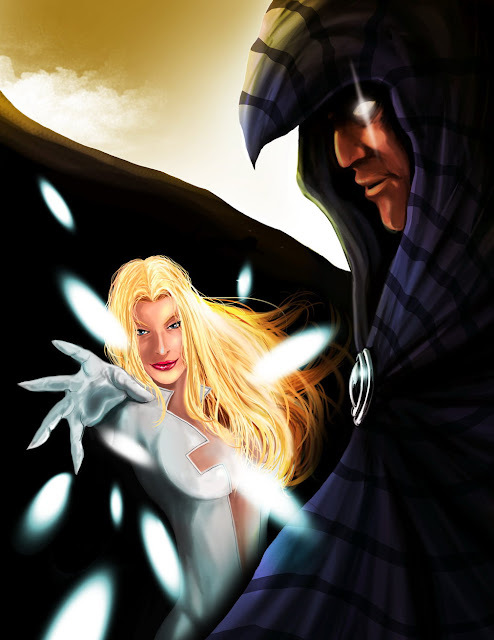 More about Cloak and Dagger (Marvel Comics) Character Review - keep reading !! Origin - Tyrone "Ty" Johnson (Cloak) and Tandy Bowen (Dagger) met in New York City as runaways. Tyrone was a 17-year-old boy from Boston, Massachusetts, with a debilitating stutter. He ran away to New York City when his speech impediment prevented him from stopping his friend from stepping in front of a moving vehicle. Tandy was a 16-year-old girl from a privileged upbringing (born in Shaker Heights, Ohio) who ran away because her multi-millionaire supermodel mother was too busy with her career and social life to spend time with her daughter. When they met, Tyrone considered stealing Tandy's purse, only to be shamed when she kindly offered him money. A thief stole the purse and Tyrone retrieved it for her. Afterwards, they had dinner and became fast friends. When the naïve Tandy accepted an offer of shelter from some strange men, a wary Tyrone went along to protect her. The two teens were soon forcibly delivered to a criminal chemist named Simon Marshall, who was developing a new synthetic heroin for Silvermane and the Maggia, testing it on runaway teens with fatal results. Johnson and Bowen somehow survived injections of the drug, and they fled. During their escape, the drug turned them into superpowered beings (it was later retconned that they were both actually mutants, and that the drug had simply awakened their latent abilities). Tyrone found himself engulfed in darkness and seized by a strange hunger which eased in the presence of Tandy, who was glowing with a brilliant light. Trying to hide his newly shadowy appearance in a makeshift cloak, Tyrone began absorbing Marshall's thugs into his darkness while Tandy struck them down with daggers of light. The two teens dubbed themselves Cloak & Dagger and declared war on drug crime in combating drug-dealers and helping runaway children. Later it was revealed that during this time, D'Spayre had manipulated these events from behind the scenes. Spider-Island - They are featured in the "Spider-Man" storyline as being homeless as they had just lost their home in New York because it wasn't up to code. They then were confronted by the Avengers who informed them about the present spider problem at hand. It's also revealed that Dagger is attending college classes as an attempt to normalize her life. Cloak has contradicting views as he acknowledges them as "special". 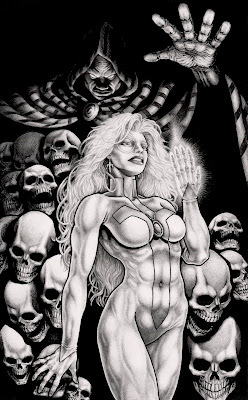 After Mister Negative hears of a prophecy that he destined to be killed by Dagger, he kidnaps her and corrupts her with his negative touch; her powers are changed, now working through the Dark Force. Similar to Cloak, she gets the "hunger" for light and starts dying from the lack of it. Cloak pleads with Mister Negative to give him the touch. He surprisingly agrees, altering Cloak's abilities to be powered by light. Cloak feeds Dagger his light, causing an explosion. In the aftermath it is revealed that Dagger now has Cloak's original powers, and Cloak has Dagger's. Cloak - Tyrone acquired D'Spayre's Dark Form, which gave him the ability to create an aperture into the dimension of darkness and to dispatch people into the darkness dimension. He also gained the abilities of intangibility, and the teleportation of himself and others through the dimension of darkness. Cloak feels a constant "hunger" which can only be assuaged by "feeding" either on light projected by Dagger or on light consumed from victims dispatched to the dimension of darkness. He later develops better control of his "hunger". Dagger - Tandy had the ability to create psionic "light daggers" which travel wherever she wills them, and which drain living beings of vitality when struck. Her "light daggers" also have the capacity to cure certain persons of drug addictions, and can alleviate Cloak's hunger for light (which simultaneously allows her to avoid becoming overcharged). Her powers work only on humans. Cloak and Dagger both have moderate experience at street-fighting, and Dagger's combat techniques utilize her light powers and ballet dance training, as well as her sense of spatial relations, which had been heightened by her temporary blindness. Cloak and Dagger were chosen as one of the many properties in Marvel's new film deal with Paramount Pictures, along with Captain America, Nick Fury, Doctor Strange, Hawkeye, Power Pack, Shang-Chi, and Black Panther.